(Entertainment Weekly) -- It couldn't top its predecessors, but "X-Men Origins: Wolverine" still brought in quite a haul, grossing an estimated $87 million for the opening weekend of the summer movie season. 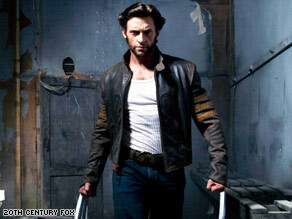 Hugh Jackman stars as the title character in "X-Men Origins: Wolverine." The Hugh Jackman pic brought in a strong $21,225 per-theater average in 4,099 movie houses, despite generating mixed reviews. The film fell $15 million short of 2006's "X-Men: The Last Stand" but it is still an enormous success for Jackman and director Gavin Hood. Matthew McConaughey's "Ghosts of Girlfriends Past" generated an estimated $15.3 million for a second place bow. It's not a shabby opening but it is far less than McConaughey's previous romantic outings including last year's "Fool's Gold" ($21.6 million) or 2006's "Failure to Launch" ($24.2 million). (Perhaps women were too busy checking out all those hunky mutants this weekend?) The two new openers did help the industry maintain its year-over-year increase of 16 percent. Also aiding that statistic was Beyonce Knowles' "Obsessed." Dropping a not-surprising 57 percent for its second weekend in theaters, the thriller earned another $12.2 million to put its ten-day gross at a shockingly strong $47 million. And Zac Efron's "17 Again" showed surprising stamina, too, grossing an additional $6.3 million its third weekend for a total take of $48.4 million. The other new wide release for the weekend was the anemic 3-D animated sci-fi film "Battle for Terra." Opening on 1162 theaters, the Justin Long, Evan Rachel Wood-voiced feature proved to be little competition for the other 3-D movie in the marketplace. Dreamworks Animation's juggernaut "Monsters vs. Aliens" grossed another $5.8 million its sixth weekend for the fifth slot in the rankings, while newcomer "Terra" couldn't muster more than $1 million for a twelfth place in the box office derby. Summer has officially begun -- at least in Hollywood -- so expect a giant event film every weekend. Wolverine may have bowed mightily but with "Star Trek" hot on its heels next weekend, the Marvel superhero is going to need more than adamantium to maintain its box office lead.